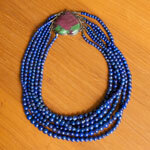 Lapis lazuli and zoisite are attractive in this handcrafted necklace by artisan Poungtong. The elegant design features 6 strings and a lovely box clasp shaped like a heart. The artisan engraves the sides of the box base with vegetal patterns. 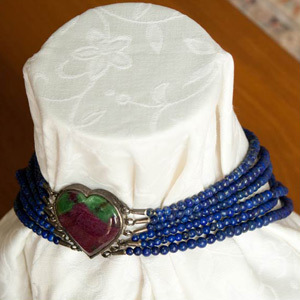 This design is meant to be worn with the heart box behind the neck. The silver parts are tarnished. Materials: Lapis lazuli, zoisite and sterling (.925) silver.